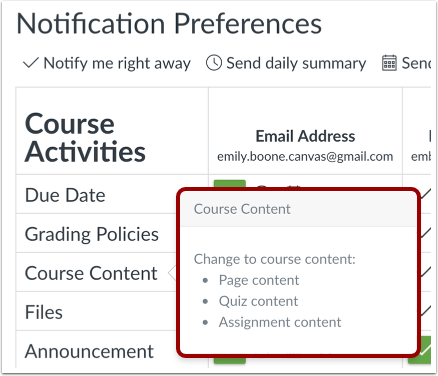 Canvas includes a set of default notification preferences you can receive for your courses. However, you can change the default settings by setting your own notification preferences. These preferences only apply to you; they are not used to control how course updates are sent to other users. To learn more about each notification, default settings, and notification triggers, view the Canvas Notifications PDF. Notifications are sent as one of four delivery types: notify me right away, daily summary, weekly summary, or don't send. If you change a setting, the change is made immediately to your account. Notification settings apply to all of your courses; you cannot change settings for individual courses. You may be able to reply directly to email notifications outside of Canvas. Replies are updated in the Canvas Inbox. However, please be aware that attachments added as part of an external reply are not included with the message shown in Canvas. Notifications are sent to Canvas contact methods as specified in your account. You cannot receive notifications if your contact methods are unconfirmed. 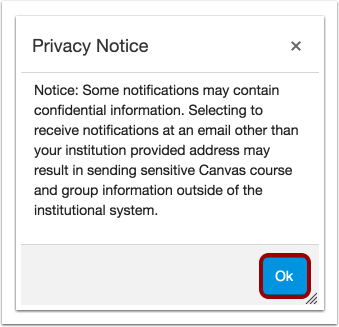 If you are not receiving Canvas notifications, please confirm your Canvas contact methods. The Canvas Student app supports setting notification preferences. However, setting preferences inside the app will override preferences in the browser version of Canvas, and daily and weekly preferences are not supported. In Global Navigation, click the Account link , then click the Notifications link . Each notification is set to a default preference. To change a notification for a contact method, locate the notification and click the icon for your preferred delivery type. To receive a notification right away, click the Checkmark icon . These notifications may be delayed by up to one hour in case an instructor makes additional changes, which prevents you from being spammed by multiple notifications in a short amount of time. To receive a daily notification, click the Clock icon . To receive a weekly notification, click the Calendar icon . The date and time of your weekly notifications are posted at the bottom of the notifications page. If you do not want to receive a notification, click the Remove icon . Each set notification preference will automatically apply to all of your courses. They cannot be set individually. Twitter and SMS notification preferences do not support daily summary or weekly summary options. Unregistered contact methods will appear in notification preferences but will not receive notifications until you confirm the registration. To view details for a notification, hover over the notification name. If you've set a notification preference for an email address that is outside your institution, you may see a privacy warning. You can close the warning by clicking the Ok button. Once the warning has been displayed, it will not display again. If you have enabled push notifications in the Canvas Student app, you can manage your preferences in the Push Notification column. Please be aware that push notifications can only be sent to your mobile device right away or not at all. Daily and weekly notification options are not supported. Additionally, setting preferences inside the app will override preferences set in the notifications page. You can set up your mobile phone as a contact method to receive notifications as text (SMS) messages. On Android devices, text messages appear from notifications@instructure.com. On iOS devices, text messages appear from area code ending in 10 (such as 210 or 410). Notification headings identify the course and the type of message notification. All notifications contain at least one text message. You cannot reply to text message notifications. Previous Topic:How do I merge my user account with an account using the same email address as a student? Next Topic:How do I add an additional email address as a contact method in Canvas as a student? Table of Contents > Profile and User Settings > How do I set my Canvas notification preferences as a student? I have tried literally everything! I disabled all notifications. I scheduled to receive weekly reports (since I get this daily, I thought it would make a difference). But nothing helped. I don't know what else to do. I'm at a loss here! Please, help!! If you've disabled everything, Canvas should no longer send you these notifications. 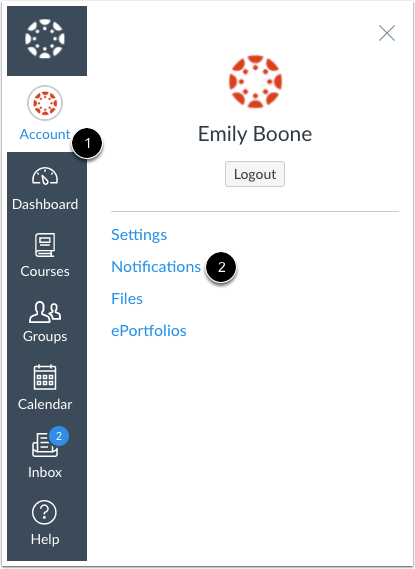 However, the faculty journal is a separate feature that must be enabled and configured by your Canvas admin or your institution's CSM, so it may have different notification settings. I would reach out to your institution's Canvas support or reach out to our Canvas Support team through one of the methods outlined in this guide: How do I get help with Canvas as an instructor? I hope this helps! My apologies for not getting back to you sooner. I'll try getting in touch with Canvas Support team and see if they can help me. I'd love to help. If you're trying to access your course, take a look at this guide: How do I use the Course Home Page as a student? If you're looking for a specific area of the course to access take a look at the Canvas Student guide. It includes a lot of helpful resources such as: how to view Assignments, how to view Discussions, and how to view Modules. If you have any other questions, please let us know! I wanted to follow up with you and make sure you were able to access your Canvas course. If not, please let us know how else we can help. If we don't hear back from you on this thread, we'll be archiving these comments in a few weeks. Let us know if you have any other questions. Re: How does a student get a notification when a quiz opens? Re: How do I stop Canvas from emailing me all notifications?